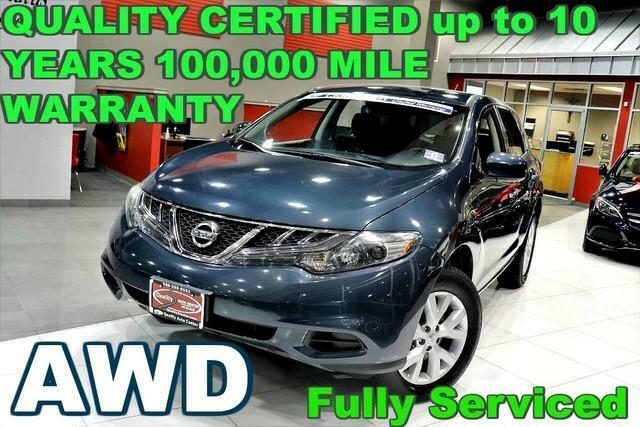 FULLY SERVICED - QUALITY CERTIFIED W/up to 10 YEARS 100,000 MILES WARRANTY Contact Quality Auto Center today for information on dozens of vehicles like this 2012 Nissan Murano S - FULLY SERVICED - QUALITY CERTIFIED W/up to 10 YEARS 100,000 MILES WARRANTY. Off-road or on the street, this Nissan Murano S - FULLY SERVICED - QUALITY CERTIFIED W/up to 10 YEARS 100,000 MILES WARRANTY handles with ease. This AWD-equipped vehicle will handle beautifully on any terrain and in any weather condition your may find yourself in. The benefits of driving an all wheel drive vehicle, such as this Nissan Murano S - FULLY SERVICED - QUALITY CERTIFIED W/up to 10 YEARS 100,000 MILES WARRANTY, include superior acceleration, improved steering, and increased traction and stability. It's not often you find just the vehicle you are looking for AND with low mileage. This is your chance to take home a gently used and barely driven Nissan Murano. This vehicle comes with an extra bonus: past service records are included. Looking for a Nissan Murano that is in great condition inside and out? Take a look at this beauty. The incredible 2012 Nissan Murano S - FULLY SERVICED - QUALITY CERTIFIED W/up to 10 YEARS 100,000 MILES WARRANTY is an invigorating performance machine that will pump adrenaline into any driver who dares to take the wheel. Do you really need any other reason to want one? More information about the 2012 Nissan Murano: Nissan's Murano stands out as offering one of the most stylish, best-trimmed, and best-appointed interiors from a non-luxury brand, with warm, soft-touch materials and color choices than make some other mainstream-brand crossover models seem drab. The Murano's powertrain, while not overtly sporty, is one of the smoothest and strongest in the segment--great for getting ahead at stoplights and making safe, quick passes on the highway. Ride quality is pretty impressive, especially with the standard 18-inch wheels-- it feels comfortable without being too floaty. This equates to confident handling without fatigue on longer drives. This model sets itself apart with warm, luxuriously trimmed cabin, one-of-a-kind CrossCabriolet model, versatile interior layout, Strong, torquey engine and smooth CVT, excellent ride quality, and stylish exterior No Credit / Bad Credit / No Paystubs, No problem !! ! All Approved ! Everyone drives ! CLEAN, GORGEOUS, LOW MILES, SHOWROOM CONDITION. CALL NOW QUALITY CERTIFIED up to 10 YEARS 100,000 MILE WARRANTY , To Certify a vehicle, there will be an additional cost for Certification. CALL NOW For details. STUNNING AGGRESSIVE LOOK ON THIS BEAUTIFUL--Call today to schedule a test drive... Good Credit/Bad Credit/No problem!!!! Get paid cash? No problem!! 100% Credit Approval with interest rates starting at 2.49% for qualified customers, our rates will not be beaten. We price our cars at wholesale price to guarantee the best deals for our customers. Our inventory moves quick, please call to confirm the availability of the vehicle of your interest Springfield location 973-564-0112. This vehicle is located at our SPRINGFIELD location. Come visit our new showroom in Springfield NJ. Quality Auto Center has a wide selection of exceptional pre-owned vehicles to choose from, including this 2012 Nissan Murano. If you're in the market for an incredible SUV -- and value on-the-road comfort and manners more than ultimate off-road prowess or tow capacity -- you'll definitely want to check out this Nissan Murano S. This Nissan Murano S comes equipped with all wheel drive, which means no limitations as to how or where you can drive. Different terrains and varying weather conditions will have little effect as to how this vehicle performs. The incredibly low mileage and painstaking upkeep on this Nissan Murano makes it a once-in-a-lifetime deal that won't last long! Call us today to reserve your test drive! More information about the 2012 Nissan Murano: Nissan's Murano stands out as offering one of the most stylish, best-trimmed, and best-appointed interiors from a non-luxury brand, with warm, soft-touch materials and color choices than make some other mainstream-brand crossover models seem drab. The Murano's powertrain, while not overtly sporty, is one of the smoothest and strongest in the segment--great for getting ahead at stoplights and making safe, quick passes on the highway. Ride quality is pretty impressive, especially with the standard 18-inch wheels-- it feels comfortable without being too floaty. This equates to confident handling without fatigue on longer drives. This model sets itself apart with warm, luxuriously trimmed cabin, one-of-a-kind CrossCabriolet model, versatile interior layout, Strong, torquey engine and smooth CVT, excellent ride quality, and stylish exterior No Credit / Bad Credit / No Paystubs, No problem !! ! All Approved ! Everyone drives ! CLEAN, GORGEOUS, LOW MILES, SHOWROOM CONDITION. CALL NOW QUALITY CERTIFIED up to 10 YEARS 100,000 MILE WARRANTY , To Certify a vehicle, there will be an additional cost for Certification. CALL NOW For details. STUNNING AGGRESSIVE LOOK ON THIS BEAUTIFUL--Call today to schedule a test drive... Good Credit/Bad Credit/No problem!!!! Get paid cash? No problem!! 100% Credit Approval with interest rates starting at 2.49% for qualified customers, our rates will not be beaten. We price our cars at wholesale price to guarantee the best deals for our customers. Our inventory moves quick, please call to confirm the availability of the vehicle of your interest Springfield location 973-564-0112. This vehicle is located at our SPRINGFIELD location. Come visit our new showroom in Springfield NJ.